Yesterday the Fed released the Beige Book which contained an even stronger emphasis on the impact of tariffs and labor shortages than the previous two publications. Along with that, all twelve districts in the U.S. said the economy is expanding moderately or at a moderate pace in their region. The issue of labor shortages isn’t new news, but employers are stepping up their enticements to try and lure potential job candidates, which include job training and no drug testing. They aren’t, however, increasing wage levels but offer non-cash benefits to entice workers. Pending home sales in September came in at 0.5%, up from -1.9% in August, and that at a time of rising interest rates to levels higher than in 2011. Along with that positive sign, realtors are reporting increases in property listings on the National Association of Realtors (NAR) Multiple Listing Service (MLS). This is the first increase in listings nationally in a long time. On Friday, October 26th, GDP will be released, and the market is bracing for the number. Analysists believe the numbers would need to be below 3% for interest rates to fall. Market expectations put the figure between 3.3% and 3.9%, which would cause interest rates to increase. This candlestick chart below covers the past weeks’ Mortgage Backed Securities (MBS) activity and the impact on interest rates. 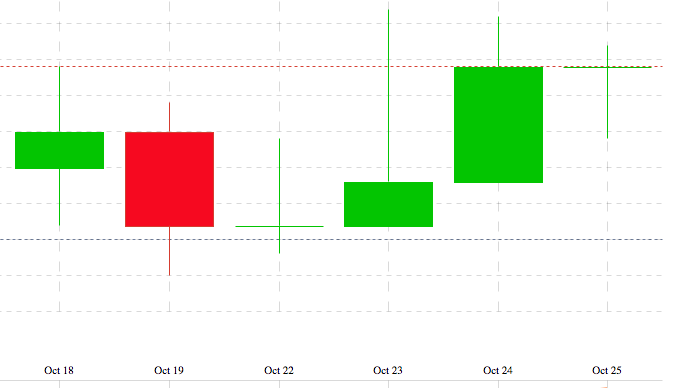 MBS were at 102.35 at the close on Oct 18th and closed trading at 102.44 October 25th. MBS directly impact mortgage rates, and the days with red indicate higher rates and those with green – lower rates. This week’s Mortgage Banking Associations’ (MBA) weekly rate survey shows effective rates increased for all loan products, with the exception of the 15-year fixed which remained unchanged. The information below applies to all loans with an 80% loan-to-value. 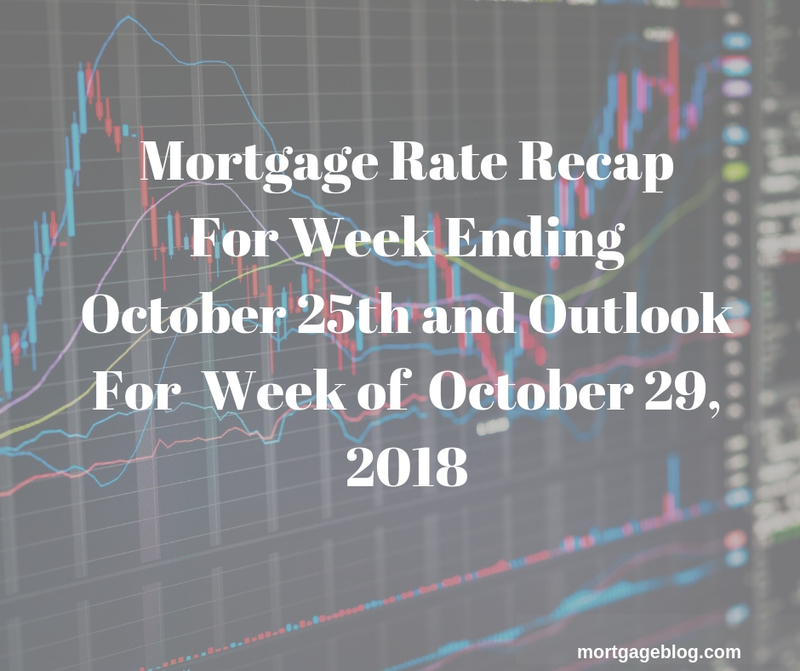 Bankrate’s weekly survey of mortgage and economic experts, countrywide, shows the majority (23%) predicting interest rates will remain unchanged next week (plus or minus two basis points), with the remaining split between 31% predicting rates will increase and the majority of 46% expecting interest rates to decrease next week. 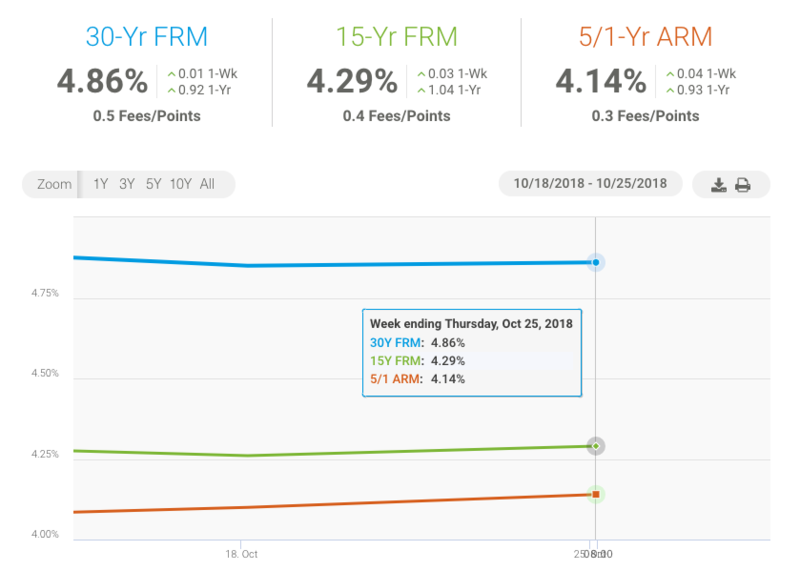 The chart below, from Freddie Mac’s weekly mortgage survey, shows conforming rates had a very slight increase for the week of October 18th to October 25th, for 30Y fixed and 15Y fixed. No question locking in an interest rate now, ahead of tomorrow’s GDP release, is the best advice. At the same time, the majority of mortgage professionals surveyed believe rates will fall next week. If rates decrease, you can expect the difference to be small enough to make floating risky.